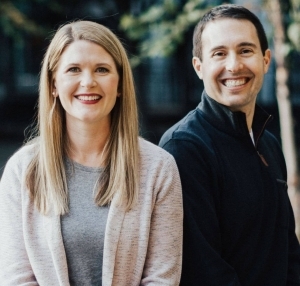 From your baby’s first teeth to straightening the smile of your adolescent, at Sprout Pediatric Dentistry & Orthodontics, we’re proud to partner with you and your child at every phase of their oral development. One way we do this is by providing both dental and orthodontic care in the same office. As your child grows, their teeth move at a rapid rate, so receiving an early orthodontic evaluation is essential. In fact, the American Association of Orthodontists recommends that kids get evaluated at seven years old, even though most care starts later on in their teen years. If your child requires orthodontic intervention, our alignment services will ensure a healthy smile later on in life. However, we also provide orthodontic care to adults. Our services ensure a proper alignment, as braces or clear aligners guide teeth gently to their correct position. But they also give patients an added boost of confidence. Those who hated showing their mouths in pictures will be so thrilled once the process is complete that they won’t be able to stop smiling. How long will the teeth straightening process take? We get a lot of questions, so don’t be afraid to pepper our orthodontist with queries during your consultation. The orthodontist will also help you and your child decide on an individualized treatment plan and the alignment option that works best — either traditional metal braces, clear braces or Invisalign®. We’ll also determine when your child should start the teeth straightening process. The path to dazzling, straight teeth is definitely worth the effort. Your child may be self-conscious with a mouth full of metal braces, but thankfully, there are several options available nowadays that make the teeth straightening process subtler. During your consultation, your orthodontist will advise you about the different choices and help you find one that works for you and your kid. Whichever you choose, just know that technological advances have made braces lighter and easier to wear than ever before. Treatment length varies from patient to patient, as everyone has their own set of unique circumstances. However, the orthodontist will give you a time estimate at your consultation and advise you on how to make the whole process as quick and effective as possible. Most people are familiar with metal braces — after all, it’s where we get the name “metal mouth.” But you won’t have to worry about that disparaging remark with this option. 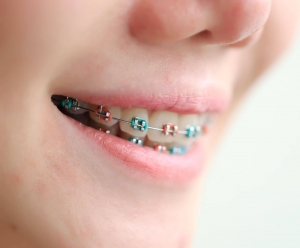 Today, the brackets used for traditional braces are smaller and much more comfortable. We also have a variety of colors to choose from to make your look unique each time you visit us. You can keep it simple or pick a crazy, vibrant hue that will definitely get you noticed. 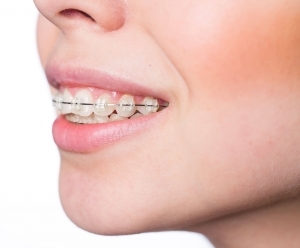 Though not technically “clear,” these braces camouflage the brackets to match your natural tooth color. Made from tooth-colored ceramic, the braces used in this teeth straightening process are similar to conventional braces. However, the natural color makes them far less noticeable. Also called clear aligners, Invisalign is actually an alternative to braces that many patients like. This option makes it easier to enjoy favorite foods and practice good oral hygiene. Basically, the Invisalign process involves a series of clear, removable aligners that will progressively straighten your child’s teeth. They’re virtually invisible and can be taken in and out as needed. In some cases, clear aligners may not be the best option, but you and your orthodontist can decide during the initial consults. If your child is seven or older, remember that it’s not too early to start thinking about orthodontic treatments. We welcome Portland, Oregon residents to schedule a consultation with our orthodontist today to begin working out the best treatment plan. Make an appointment online or call us at 503-477-9911.